Cairngorms is the area of North East Scotland in Aberdeenshire, Moray, Highland, Angus and Perth and Kinross that is contained within The Cairngorms National Park Boundary. 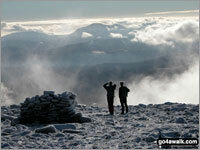 The Cairngorms National Park was established in 2003 by an act of the Scottish Parliament and made larger in 2010. Covering and area of 4,528 km² (1,748 sq miles) the Cairngorms National Park is the largest national park in the British Isles and includes the Cairngorms range of mountains and surrounding hills. It is almost twice the size of the Lake District National Park. Five of the UK's six highest mountains lie within the park and the main settlements are Aviemore, Ballater, Blair Atholl, Braemar, Carrbridge, Dalwhibnnie, Glenlivet, Grantown-on-Spey, Kingussie, Newtonmore and Strathdon. The UK's lowest temperature of -27.2 �C has twice been recorded at Braemar - in 1895 and 1982 - and the highest official British record for wind speed of 278 km/h (173 mph or 150 knots) was recorded on the summit of Cairn Gorm in 1986. NB. Shetland holds the unofficial British record for wind speed of 285 km/h (177 mph) at RAF Saxa Vord in 1962. The Cairngorms National Park in Scottish Gaelic is P�irc N�iseanta a' Mhonaidh Ruaidh.